Contrasting with its title, this is one of the most brilliant movies made about the Second World War. It contains important reflections on the role of public opinion in History, and the duty of political leaders and heads of state. A true work of art, the film takes the United Kingdom as an example to show the deadly duel between truth and falsity in human heart and public life, a struggle very much alive in the 21st century, when “public opinion” is easily fabricated in most countries by propaganda campaigns acting on conscious and subconscious levels of the mind. In the beginning of the second world war, Winston Churchill challenged such a tribunal, as he insisted in the “strange idea” that people of good will should actually defend the United Kingdom and Western civilization against Nazi aggression. True sages and statesmen unmask collective ignorance. In 1939-1940, appeasers dominated the public opinion. Hitler seemed invincible. Making peace with Nazi Government in Berlin was – from the point of view of mental laziness and moral defeat – the only thing to do. Winston Churchill was therefore seen as a madman for daring to resist, and his ideas were labelled as absurd at best. “Darkest Hour” is highly recommended for theosophists and friends of mankind who seek for truth and adopt as their own the probationary task of challenging false consensus. The story of the film shows how honesty and moral courage defeat political correctness. It demonstrates the importance of thinking by oneself, and teaches one or two lessons in advanced esoteric philosophy. It sets an example to follow in our century, in philosophical and theosophical associations as in every department of life. Available in DVD. 125 minutes. Starring Gary Oldman as Winston Churchill. Director: Joe Wright. “The Mahatma Letters”, p. 233. “The Mahatma Letters”, p. 224. “Letters From the Masters of the Wisdom – Second Series”, 1948 edition published online, see Letter 10, p. 28. In the 1973 edition, TPH, it is the same page. “Letters From the Masters of the Wisdom – First Series”, 1948 edition published online, see Letter 7, p. 31. In the 1973 edition, TPH, it is Letter 7, p. 28. 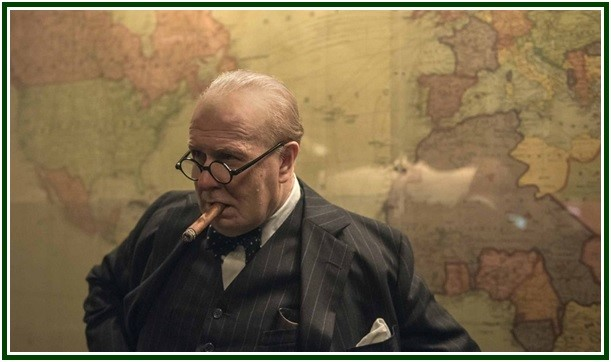 Click to watch the trailer of the film “Darkest Hour”. An initial version of the above article was published at “The Aquarian Theosophist”, June 2018, pp. 6-7. It had no indication as to the name of the author. Original title: “Churchill and the Public Opinion”. “Churchill Challenges Public Opinion” was published in our associated websites as an independent article on the 1st of October, 2018. Click to see the articles “Freedom From Mind Manipulation”, “The Power of Suggestion”, and “Freud on Freedom From Delusion”. Examine “The Process of Suggestion”, “The World War in Our Minds”, “Neptune, a Mystery In Front of Us”, “Theosophy, on Alcohol and Drugs”, and “Awakening from the Opium Wars”.